Damaged curbing in a city is not only an eyesore but can be a severe security hazard also as it can cause people to trip and fall. If you have a broken concrete sidewalk in your Tacoma neighborhood, you need to find a reliable contractor who can fix the damaged area. An experienced contractor is required for repairing a damaged curb as it is a technical task. The process of curb repair is a multi-step procedure which includes using a dry mixture to allow an immediate finish. The removal of the damaged curb is also professionally done to give a sharp appearance to the edge. Concrete walkways and sidewalks are so much more than a way to reach places; they can be used to enhance the overall appeal of your home. Due to the increasing availability of decorative concrete options, you can creatively use them as a form of artistic expression. Even though grey is the most common surface used for concrete walkways, stamped concrete now provides you with an array of colors which make your walkway much more interesting. With concrete becoming a popular decorative, a number of options are available to customize your home to make it suit your personality. 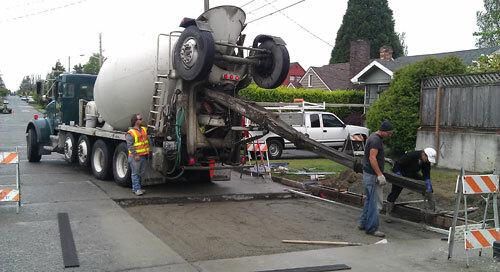 For residents of Tacoma, Cook’s Concrete Construction, Inc. provides you with the best services in this field with its team of experienced contractors. 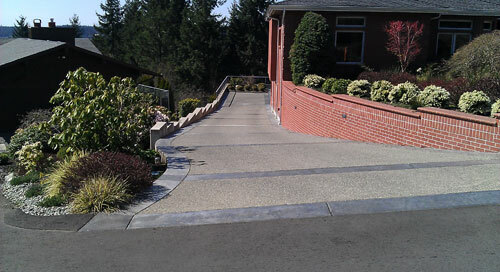 For those of you who have a concrete driveway, you understand that it is probably the most used part of your home. Vehicles drive and park over it daily. This can lead to a lot of wear and tear which could cause serious damage. It is important to get any damage repaired as early as possible. If water freezes within the cracks, the ice will expand which will cause the cracks to further expand and cause more damage. Call Cook's Concrete Construction, Inc. for immediate repairs and prevent your driveway from defacing the appeal of your home. We are known for our excellent service and complete our work with minimal obstruction to your daily activities.